At DrainJet we use our tight access combo truck to perform NDD work. This unit allows us to get into lots of areas the bigger trucks can’t get to but still digs as quickly as a larger truck. We have made a conscious decision that we will not become totally focused on NDD as most of the larger drain cleaning companies have become, we are specialist drain and pipe cleaners who also perform NDD, not the other way around. Please contact Geoff if you require more detailed specifications than listed below. 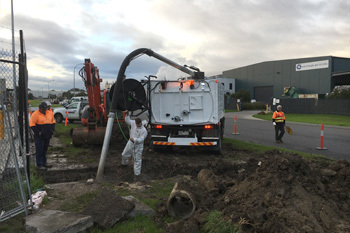 Built on a 13.6t Hino Macdonald Johnston Vacuum truck, High CFM vacuum using a 6” boom with the ability to vacuum up large debris objects quickly and efficiently. When digging we run the water pump at 35 LPM @ 4000 PSI, pressure and flow can be reduced if requiring a less aggressive stream of water. We have built a tight access combination truck that can go almost anywhere and do most of the tasks a bigger combo can do. Unit can dig up to 6 meters deep.